An important educational resource for both skeptics and Christians. Hundreds of surprising, fun and challenging quotes taken straight from the Bible. With many additional quotations from historical and contemporary religious skeptics. How well do you know the Bible? If your only exposure to biblical texts is the scripture reading in your church on a Sunday morning you may be surprised at what else can be found buried deep within its pages. Here, presented in a fun and attractive interface, are several hundred unusual, humorous and often confronting quotations taken straight from the pages of the King James Version. 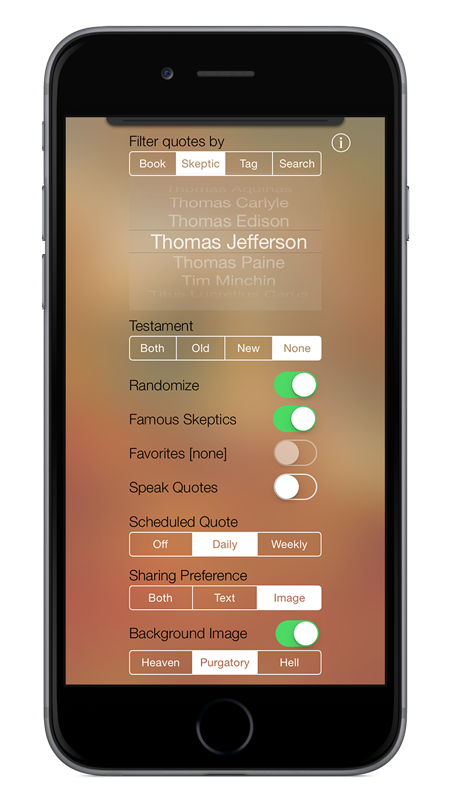 The quotes can be filtered by testament, by book of the Bible, by subject tags, or searched by keyword. 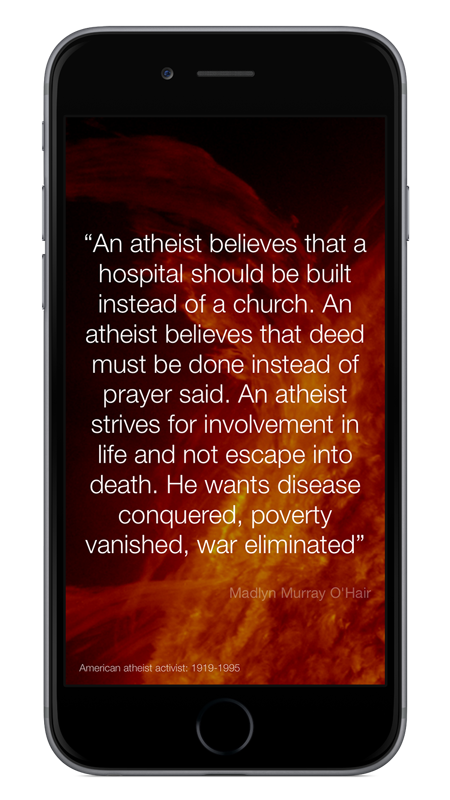 Also included are hundreds more quotes from a wide range of well known historical and contemporary religious skeptics, including prominent politicians, philosophers, authors and celebrities. See the quotes in their original context in the bible by tapping the Bible Reference beneath each one. You can also find out more about a quoted religious skeptic by tapping his or her name. Choose from a range of great background colors and themes, save quotes as Favorites, and send quotes to your friends on Twitter, Facebook or email. 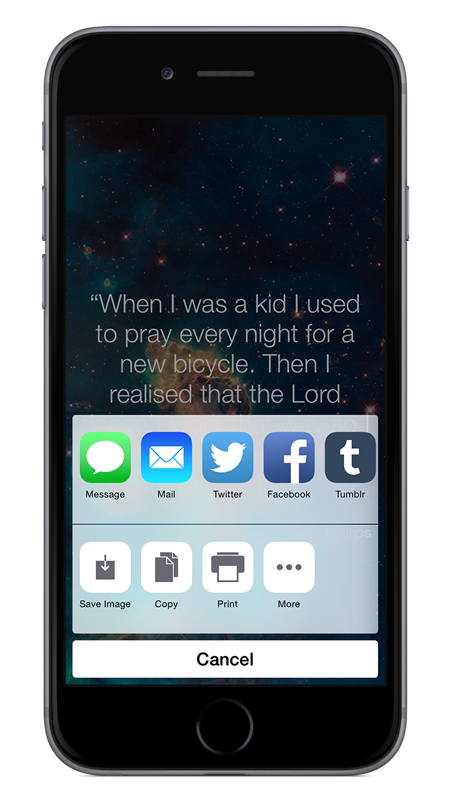 A random quote can also be scheduled as an automated daily or weekly iPhone or iPad notification. *NEW: Create your own Biblical or skeptical photo memes. 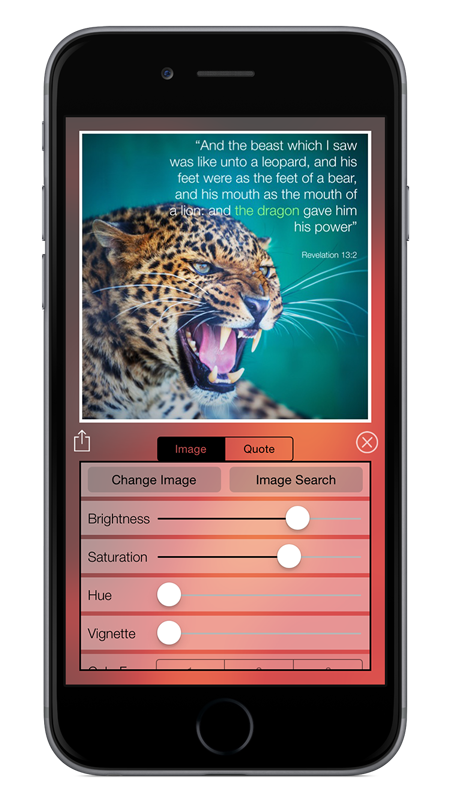 Choose a quote, download an image, apply text and image effects, and share your creation on social media sites like Twitter, Facebook or Instagram. You can use one of our quotes or write your own words of wisdom! We all know that there's lots of good advice in the pages of the Bible. Many verses promote kindness and compassion, and these are the sections most often read and preached. But to fully understand the Bible and see it in its proper context it is important to be aware of the many passages that are rarely mentioned. Many of these are violent, intolerant and, from a modern perspective, strange and disturbing. Some are best viewed as a metaphor or read with a good sense of humor. But unfortunately many still believe these words in a very literal way. It is our hope that this app will promote discussion and rational thinking in regard to the Bible and all of religion.